Jule Charney was a meteorologist who worked at Massachusetts Institute of Technology (1956-1981). His research specialties included numerical weather prediction and dynamic meteorology. His other institutional affiliations included University of California at Los Angeles, University of Chicago, and the Institute for Advanced Study. January 1, 1917Birth, San Francisco (Calif.). 1938Obtained AB in Mathematics, University of California, Los Angeles, Los Angeles (Calif.). 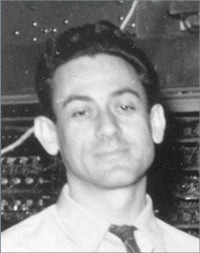 1940Obtained MA in Mathematics, University of California, Los Angeles, Los Angeles (Calif.). 1946Obtained PhD in Meteorology, University of California, Los Angeles, Los Angeles (Calif.). 1946 – 1947Research Associate, University of Chicago. 1947 – 1948National Research Fellow, University of Oslo. 1948 – 1956Member (1948-1956) and Director, Theoretical Meteorology Project (1948-1956), Institute for Advanced Study, Princeton (N.J.). 1950 – 1955Visiting Lecturer, University of Chicago. 1956 – 1981Professor of Meteorology (1956-1966); Chair, Department of Meteorology (1974-1977); and Alfred P. Sloan Professor of Meteorology (1966-1981), Massachusetts Institute of Technology (MIT), Cambridge (Mass.). 1957Fellow, American Academy of Arts and Sciences. 1964Member, National Academy of Sciences. 1968 – 1971Chair, United States National Committee on Global Atmospheric Research Progress, National Academy of Sciences. 1976Awarded William Bowie Medal, American Geophysical Union. June 16, 1981Death, Boston (Mass.). Both employed at University of Chicago. Both employed at Massachusetts Institute of Technology. Both employed at Institute for Advanced Study. Member and Director, Theoretical Meteorology Project. Professor of Meteorology; Alfred P. Sloan Professor of Meteorology; and Chair, Department of Meteorology. Research Associate and Visiting Lecturer. Received 1976 William Bowie Medal. Member and Chair, United States National Committee on Global Atmospheric Research Progress. Obtained PhD (Meteorology) in 1946. Obtained AB in 1938 and MA in 1940. Oral history interview with Jule G. Charney, 1980 August 25, 26, 27 and 28. Oral history interview with Akio Arakawa, 1997 July 17 and 18. Oral history interview with Akira Kasahara, 1998 November 2 and 3. Oral history interview with Bert Bolin, 2001 May 3. Oral history interview with Edward N. Lorenz, 2000 November 8. Oral history interview with James Hansen, 2000 October 23 and November 27. Oral history interview with Joseph Smagorinsky, 1986 May 16, 17 and 21. Oral history interview with Philip Duncan Thompson, 1986 December 5. Oral history interview with Syukuro Manabe, 1998 March 14 and 15. Oral history interview with Thomas F. Malone, 1995 January 4. Oral history interview with Walter Orr Roberts, 1987 August 21. Philip D. Thompson papers, 1944-1994. Storm watchers : the turbulent history of weather prediction from Franklin's kite to El Niño / John D. Cox. Jule Gregory Charney: 1917-1981, Biographical Memoirs of the National Academy of Sciences. Storm world : hurricanes, politics, and the battle over global warming / Chris Mooney. The atmosphere, a challenge : the science of Jule Gregory Charney / edited by Richard S. Lindzen, Edward N. Lorenz, George W. Platzman.